The days when a Blu-ray player merely spun discs and made tentative contact with the internet via BD Live, are long gone. 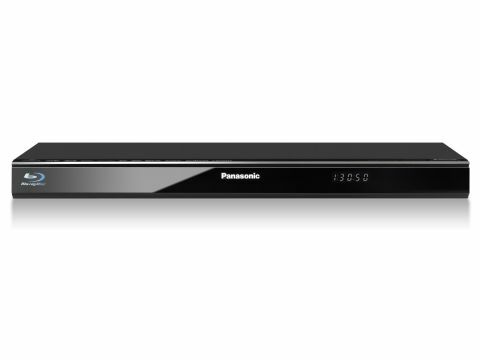 Decks like this Panasonic DMP-BDT220 are network connected in the truest sense, as happy to stream IPTV as they are to play the latest 3D Bu-ray releases. The DMP-BDT220 is one five new 3D compatible BD players from Panasonic for 2012. It sits just above the entry-level DMP-BDT120, and below the more advanced DMP-BDT320 and the audiophile grade DMP-BDT500. Joining it in the range is the oddball DMP-BBT01, a compact designer player not much bigger than a couple of Blu-ray cases. Not that this model is carrying any surplus weight. It follows the full-width (430mm), half-depth (185mm) design which has become so popular with mainstream brands, and stands just 38mm tall. One consequence of this half-deep design is that you can't sandwich it between other full-size 430mm components, it has to sit on top. Cosmetically, the deck is pretty anonymous. A full-width grey fascia flap conceals the loading tray, front-mounted USB port for media playback and SD card reader. At the rear of the player you'll find HDMI, composite video and stereo phono audio and optical digital audio outputs. There's also a second USB, intended for a Skype camera, as well as an Ethernet port. If you don't have a wired network connection in your viewing room, don't worry, the DMP-BDT220 has Wi-Fi onboard.